There is an opportunity cost for everything in the world. When you buy and decide to HODL Bitcoin or any other cryptocurrency, there is an opportunity cost involved. Let say you bought 1 BTC for $3000 and now when you HODL it you are holding 1 BTC which otherwise could have been invested somewhere more to earn interest on it to make it 1.1 BTC. Yes, of course, there are, but not all are comfortable and used to trading crypto. Everyone knows about lending, and the same concept of lending if applied to cryptocurrencies makes it as crypto/Bitcoin lending. Moreover, in this type of lending, you have your underlying cryptocurrencies as collateral. In simpler terms when someone lends their USD or EUR or stablecoins to a borrower on an agreed rate of interest for an agreed duration against their crypto collateral, this is crypto lending. Similarly, when someone borrows extra cryptocurrencies or USD or stablecoins against their cryptocurrency holdings, it is called crypto borrowing. Now that you know the introductory part of crypto borrowing and lending let’s dwell into how crypto/Bitcoin lending works !! How does Crypto/Bitcoin lending work? The working of crypto lending is quite straightforward. The borrower needs to collateralized his/her cryptocurrencies as collateral and as per the agreed rate, duration, and LTV, he/she is issued the crypto loan. For the lenders also it quite easy as they need to decide to lock-up their funds for the agreed duration of lending as per the agreed rates. This enables them to earn extra interest on their capital that they were just holding previously. Moreover, there are no rigorous KYC checks or credit history inquiries that undergo before carrying on crypto lending. This is precisely because the crypto loans are already overcollateralized as well as the borrowers don’t have a single source of truth that can act as a reliable credit history source. And when it comes to Bitcoin lending, the process is similar to lending/borrowing any other cryptocurrency. But since Bitcoin is the pioneer cryptocurrency much of the crypto lending market exists around it. Plus there are better lending/borrowing rates and better LTVs available while using Bitcoin. Moreover, the custodial storage infrastructure is much robust and readily available for Bitcoin in comparison to other cryptocurrencies. Now, that you know how the crypto/Bitcoin lending cycle works, it is indeed imperative to understand the working of Bitcoin/crypto lending platforms which facilitate this lending. how do crypto/bitcoin lending platforms work? #1. 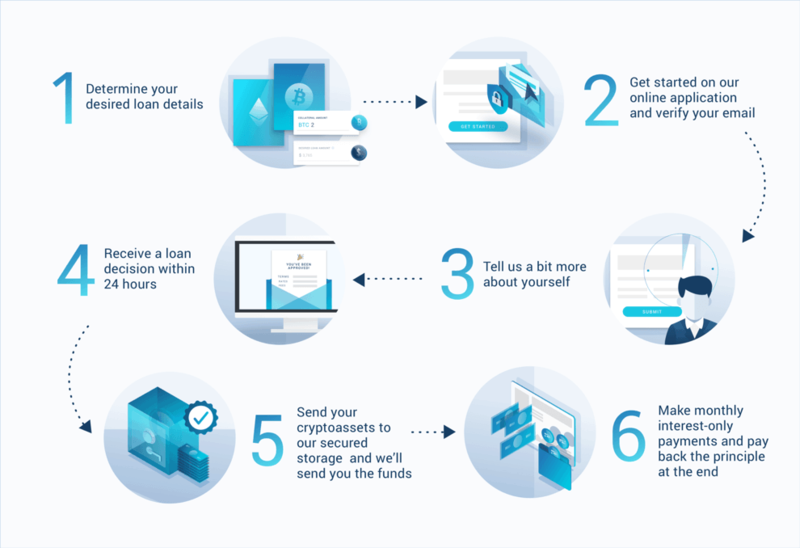 Of course, first, you need to register with the crypto lending platform using your email. #2. Then you need to complete their KYC process by submitting relevant photo ID proofs. #3. Once your KYC is complete, tell them about your loan requirements and submit an application. #4. Receive a loan decision within 24 hours including the LTV you are eligible for and the rate of interest you will be required to pay. #5. Now, you can send your cryptoassets to their safe custodial solution. #6. Once the cryptoassets are settled on the blockchain, you will receive the promised loan amount in your bank account or stablecoins withing 90 minutes. #7. Keep paying the interest only payments monthly and pay the principal altogether in the end. Some companies like Nexo, don’t require you to pay the interest also in the beginning and you get the option to pay the whole amount back in the end too. 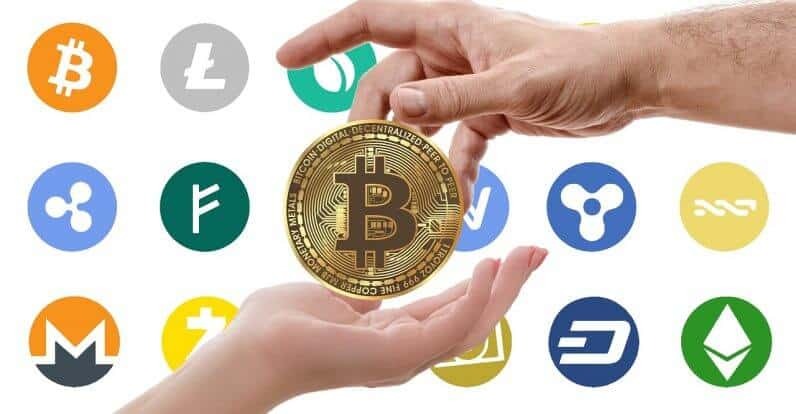 Check out some of the best Bitcoin and crypto lending programs that we have vetted and selected for you !! Moreover, these lending platforms are also giving 6-7% interest on deposits that you make with these platforms. For example, Nexo is offering 6.5% interest on the stablecoins that investors deposit with them. The eligible deposit stablecoins are DAI, PAX, USDC, USDT & TUSD. Even more assets coming soon. On the other hand, BlockFi is offering, BlockFi Interest Account (BIA) which is interest-bearing savings account for crypto lenders. You just need to store your BTC or ETH with BlockFi to earn 6.2% compounding annual interest rate on your deposit that you will receive monthly. When it comes to regulatory talks around crypto, the situation becomes a bit tricky. As of now the regulation around crypto is highly fractured and fragmented across the globe and for crypto lending services it is no different. Many of the crypto lending services are operating only in one or two jurisdictions where there is some regulatory clarity. For example, BlockFi is operating in 45 states in the USA and is compliant with both the federal and state level guidelines. Another big player in the crypto lending space, i.e., Nexo claims to be regulated by SEC because they have their native security token. Also, they have different legal entities in different countries as it services 200+ jurisdictions across the globe. For the rest companies also they are operating in their small arena untill the regulatory framework is set on a global scale. In the U.S., lending is regulated on the state level for non-banks and fintech companies. This regulation is similar to the MSB state-by-state approach used by crypto exchanges. So any crypto lending company which aims to do Bitcoin/crypto lending must adhere to this. Bitcoin lending is unregulated in South Africa, but Bitcoin itself is allowed. Of course, there are other taxes such as capital gain taxes on Bitcoin in South Africa. India is relatively backward in terms of cryptocurrency regulations. In 2018, the RBI severed the relationship between banks and crypto businesses which has led to chaos in the cryptosphere of India. Regarding lending of cryptocurrencies too, there is no clarity in the Indian ecosystem. However, you will find some Indian exchanges dealing in margin lending and trading. Bitcoin and crypto lending in Australia is regulated. For example, Helio Lending is a licensed and regulated cryptocurrency lender, based in Australia. This lending service provides holders of cryptocurrency a safe and secure way to access fiat funds, without selling any of their cryptocurrency. Helio Lending issues loans under an Australian Credit License (ACL #391330). Canada has been particularly generous towards Bitcoin and other cryptocurrencies, and that’s why you will find crypto lending services like Ledn operating from Canada. 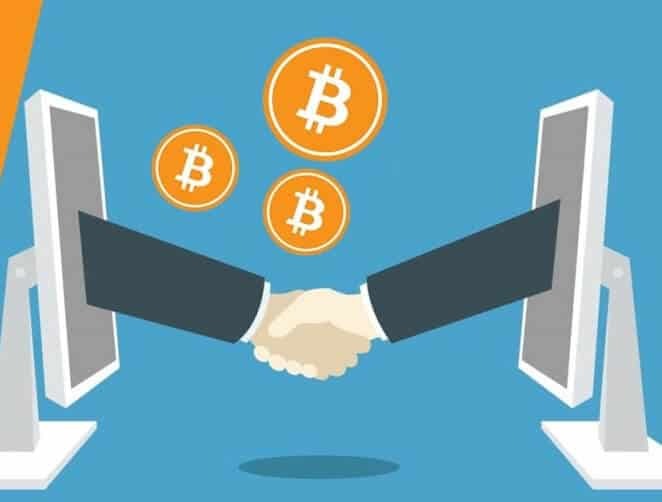 Bitcoin and crypto lending has many risks to start with but they dwarf the advantages, and that’s the reason you have many companies starting-up in this space. But the main risk of crypto lending is about custody. But anyways, I see it this is the major risk as of now in the crypto lending space. Regulatory Unclarity: There is no single international body or regulatory framework to treat cryptocurrencies like Bitcoin. That’s the reason that many lending services are acting in their fractured way in their native jurisdictions. Blockchain Is Immature: The blockchain infrastructure is still immature to inculcate a complex business like lending and borrowing. We don’t know who is writing these smart contracts and what’s their authenticity and reliability. Volatility: Cryptocurrencies are wildly volatile and the time it takes crypto collateral to change address is enough to move markets 10-20%. This can result in margin calls to the borrowers who have borrowed money by keeping their cryptocurrencies as collateral. And in drastic volatility, the borrower will be expected to increase the collateral or liquidate some of his/her collateral to rebalance the loan. This can result in an unpleasant experience for the borrower who never wanted to sell his/her bitcoins for a loan. So these are some of the challenges and risks that I perceive that crypto lending space might face in the coming days. Having said that, crypto lending will someday become the predominant form of lending because this is natively peer-to-peer. Moreover, crypto lending gives credit access to billions of people who don’t have decent credit scores or history with credit bureaus. So that’s all from TheMoneyMongers in this edition of crypto and Bitcoin lending. We shall be back soon with more exciting guides on crypto lending, untill that time, keep learning about the crypto revolution with us ! !